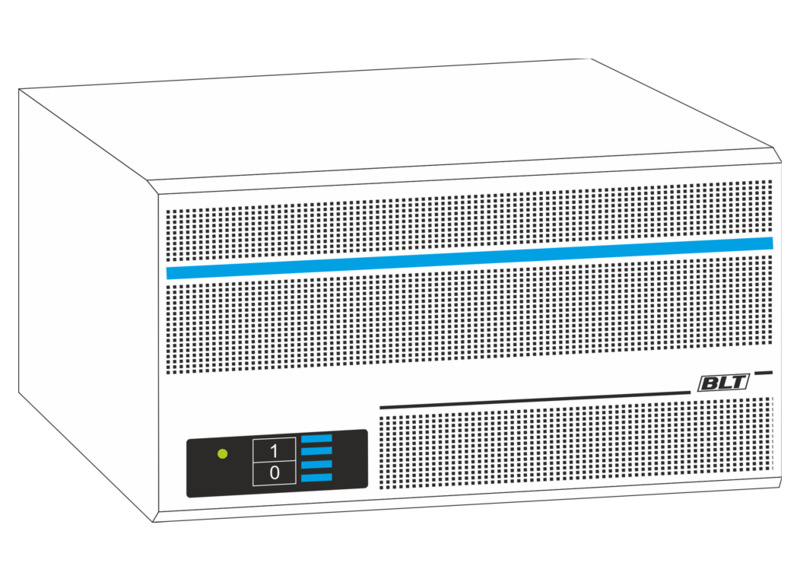 The BLT SMS-4U is a 12 channels Video Server, with simultaneous recording while playback, featuring full HDTV capability, stereoscopic recording for S3DTV and ready for 4K/UHDTV. Recording sources can be separated cameras (ISO-Cam use) or High Speed Cameras to perform Super Slow Motion up to x8. The extended version, 8R4P allows up to 8 cameras recording or 2 High Speed cameras. Multiple Playback channels configuration can be either multiple independent users or coupled as Program/Preview to allow live instant action editing. Multiple Audio interfaces (SDI, AES/EBU, Analog and MADI) up to 128 Audio recording tracks. Thanks to its compact and limited size (5 unit rack), SMS-4U is particularly suited for live sport and news applications for Studio and OB VAN. The BLT SMS-2U is a compact 6 channels Video Server, with simultaneous loop recording while playback, featuring full HDTV capability and stereoscopic recording for S3DTV. Recording sources can be separated cameras (ISO-Cam) or special cameras as High Speed Camera for Super Slow Motion or Ultra Motion. Multiple Audio interfaces (SDI, AES/EBU, Analog and MADI) up to 64 Audio recording tracks. Thanks to its compact size, SMS-2U is particularly suited for live sport and news applications for Studio and OB VAN. The Remote Unit System is specifically optimized for the professional end-user to provide the fast and efficent interface necessary for live sports applications: clip mark and management, sequences, Play-lists, High-Lights, multicamera, networking to share Clip datas and more over. It is designed to unleash the advanced capabilities of BLT VIDEO SERVER, while keeping it’s user friendly operating characteristics. With the largest color LCD display of the category and 4 indipendent control ports, RUS-COLOR allows just a single operator to simultaneously or independently control up to 4 BLT Video Servers for instant highlight creation and live editing. On the top of this, RUS-COLOR, thanks to its compact size, fits into limited space available on OB-VAN. 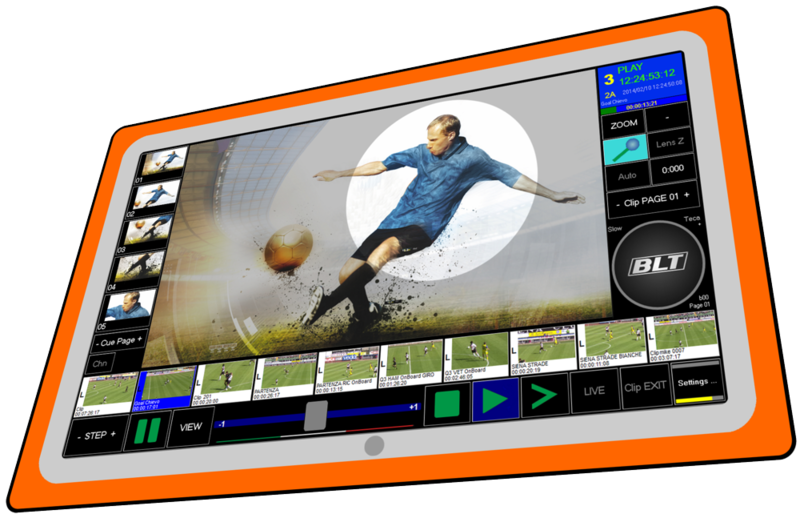 SportTouch is the BLT integrated production suite consisting of a BLT Videoserver SMS-U Series, RUS Control Panel and the RUS-TAB (touch screen tablet style control panel). 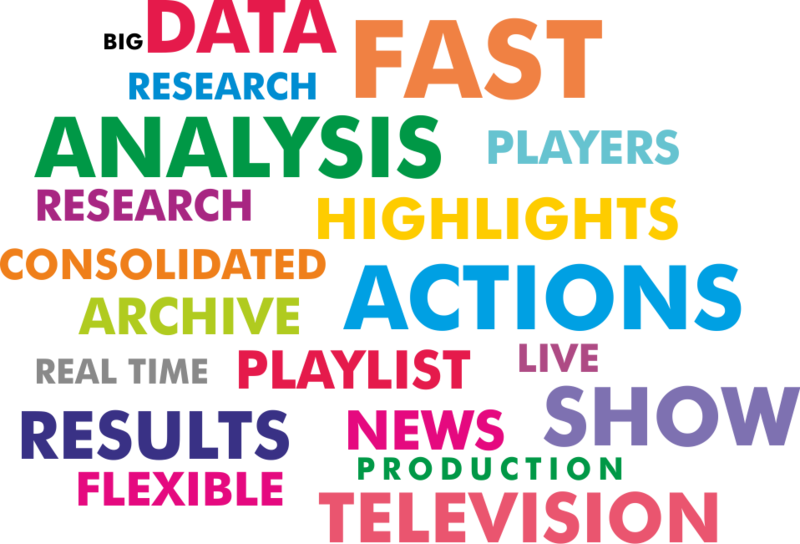 This unleashed solution provide a new production work-flow used for applications such as sports slow-motions, clip contribution, on the fly high-lights creation, DVE, Zoom, Telestrator and graphics. 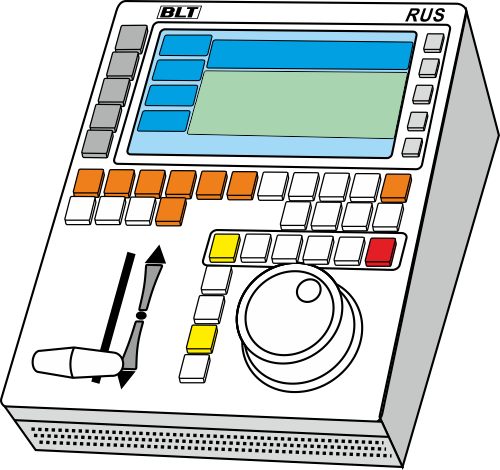 The RUS-TAB tablet operation offers an intuitive interface with user friendly gestures like smartphones do: It is fun! This allow it to be used either as extension by the reply operator or to enable direct control by commentator and on-air talent.